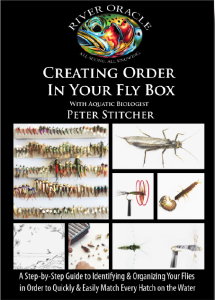 Learn to identify EVERY fly on the water and fly in their box according to the insects and life cycles they imitate, and be shown how to organize them in a easy to understand an intuitive method allowing them to quickly match EVERY hatch on the water. Following the Hatch Organization Method, one page of the viewer's fly box being dedicated to the aquatic life cycle of trout foods under the surface of the water, while the opposite page of your box will be dedicated to the adult life cycles flying and floating on top of the water. Each row of the fly box will be dedicated to an order (family of flies) – midges, mayflies, caddis flies, stoneflies, etc. On the water, the viewer will then be able to follow the hatch and the feeding trout just by finding the correct row to match the active insect order, and then follow the progression of that hatch just by running their finger across a single row in their fly box. Translation- catch more fish! 82 min.